Of Shadows: 100 Objects from the Museum of Witchcraft & Magic. 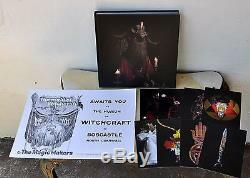 Special Edition 1/50 Signed w/ 8 Prints + Archival Artefact Occult Art. One Hundred Objects from the Museum of Witchcraft and Magic. Sarah Hannant and Simon Costin. Strange Attractor Press, UK, 2016. Special Limited Edition One of 50 copies. Signed by Sarah Hannant and Simon Costin. 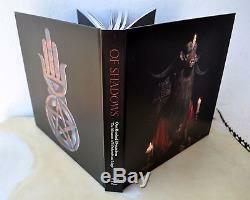 Of Shadows: One Hundred Objects From The Museum Of Witchcraft And Magic. By Sarah Hannant and Simon Costin 225 x 225 mm, 240pp Over 120 images in colour & BW. 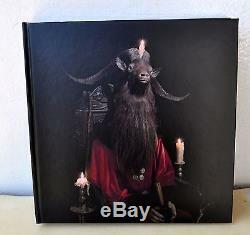 Special Edition (50 copies, signed and numbered, with a set of eight postcards and an original archival artefact from the Museum's collection) One hundred objects, exuding magic and mystery, emerge from the darkness of Cornwalls much-loved Museum of Witchcraft and Magic in this book of haunting photographs. Artist and photographer Sara Hannant has captured the very essence of these carefully-selected artifacts, including wax dolls, wands, statues, daggers, pendants, robes and amulets. Each striking image tells its own vivid tale of belief and ceremonial practice. Accompanying the photographs are informative texts from Sara Hannant and Museum director Simon Costin, as well as an illuminating introduction by the leading historian of British witchcraft and magic, Ronald Hutton. Saras pictures are rites of evocation a radically new and exciting approach to the work of representing the past to the present. Of Shadows: One Hundred Objects From The Museum Of Witchcraft And Magic is not currently available in mp3 download format. Of Shadows: One Hundred Objects From The Museum Of Witchcraft And Magic is not currently available in wav download format. 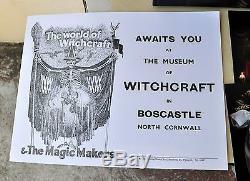 The Museum of Witchcraft, at Boscastle, Cornwall, houses the artefacts of the Richel-Eldermans collection, kept by the Museum of Witchcraft. Many of the occult images, sigils, diagrams, drawings and paintings were reproduced in. Which was published by Three Hands Press. It also has many other important artefacts associated with witchcraft and magick, including unique artefacts owned by Aleister Crowley, Gerald Gardner, Stewart Farrar as well as items associated with the Golden Dawn, and many other fascinating artefacts. This book focuses on 100 artefacts from the collection. Each has been photographed, and has a page long explanation and details, opposite each photograph. 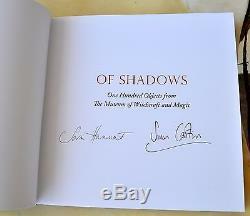 This special collector's edition has been signed by both authors, and was limited to only 50 copies. 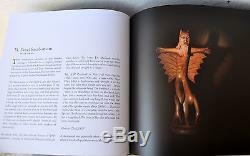 It includes 8 postcard sized prints of some of the artefacts reproduced in the book. In addition, there is an A4 sized archival artefact from the Museum, which is an old advertising sheet, that the Museum used to use. This is archival stock from the Museum, and is an original promotional sheet, and not a reprint. 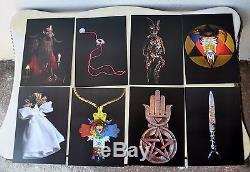 These were made available with the special edition, and is included here, together with the set of 8 prints. 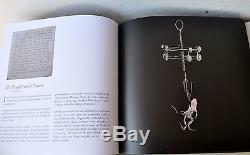 Check out my other items as I have the deluxe editions of this book, also available, as well as many other rare books published by Three Hands Press & Xoanon, and numerous other occult books, grimoires, occult art, and magickal artefacts. I also have original drawing by Richel, from 1960, as well as drawings & paintings by Orryelle, Barry Hale, Daniel Schulke & others - that I will be listing soon. Be sure to add me to your favorites list. As I will be listing many other Rare & hard-to-find books, artworks and many other items of interest. The item "Of Shadows 100 Objects from Museum of Witchcraft Special Ed 1/50 Signed w Prints" is in sale since Friday, November 11, 2016.